I thought it would be a simple task, to make a list of items suitable for kids ( and adults) to put into Christmas stockings. I figured I would look for small items, inexpensive, that kids and/or adults could do. 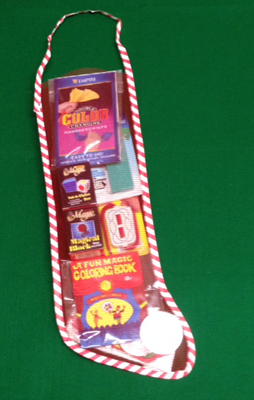 I have made Magic Christmas Stockings before. Unfortunately, I did not have a category for Magic Kids Can Do. I had Magic For Kids and Kidshows but that is not the same thing. I decided we needed that catagory to make things easier for you in case you too are looking for tricks your young children, grandchildren, nieces and nephews. We are currently working on that list. If you bought these individually it would come to $39.00 or $40.00, however, as a Christmas Special there is a 25% discount which comes to $29.00. S0 f0r ages 5 to 95, if you’re starting magic, this would be fun and easy! Our list should be ready in a day or two. Last week I wrote about Magic Tom, a famous and well loved magician here in Montreal, Quebec and I received a comment from someone who had lived in Montreal and had moved away. She read my post and looked him up and was thrilled to see that he was not forgotten. It made me think about other magicians who had a great influence on the Montreal Magic scene, not necessarily TV stars, as Tom was, but nevertheless had an impact here. Le Grand Marcis, Maurice Choquette, was one of these people. He had a little magic shop on de Bienville when we met him and he gave weekly magic courses and had a great following. We were friends with him and he was kind enough to translate many of the popular card tricks for us when we first went into business. I have a copy of Wild Card “Les cartes “frimées” which he did for us “Traduction et adaptation française faite par “Le Grand Marcis” 1977 and many others as well. 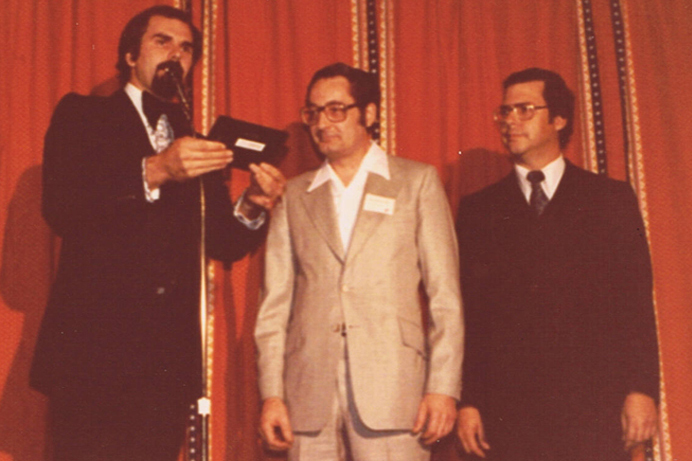 This is a photo of Marcis at Magic Montréal being presented with a plaque by Wim Vermeys with Phil Matlin looking on in recognition of what he had done for magic here. I’m not sure of the year, but it was long ago, as both Phil and Vermeys had a full head of dark hair. I’m not sure when Marcis died, but he was not that old. It was at least 7 years ago, but probably more, that Réjean Pagé came into our shop to talk about a project he was working on and asked if we would help him. We had known Réjean a long time and we said we would be happy to help him. He wanted to make a website for Magic Tom Auburn who many of us remember. He couldn’t get the info from the TV stations that Tom worked for and so we called Tom’s son, Byron. Byron asked if we trusted Réjean and how long we had known him, etc, and we said he was a sincere guy who was serious about this endeavour. We arranged a meeting and Byron and his sister came up to the shop with a big box of photos and posters etc, and presented it to Réjean. It was a touching meeting and left all of us in an emotional state. If you check the website you will see that Réjean did a good job. The other day a gentleman, unknown to us, came into the shop. He, too, wanted to keep Tom Auburn’s name and memory alive. He’s a writer and he is passionate about history and about Magic Tom and he is writing an article (on real paper) which will appear in the Quebec Heritage News, which is an English language Quebec Magazine. His name is Rohinton Ghandhi, Ro, for short,(and actually related to Ghandi) and there is an article written by him in the Fall 2013 issue about “Rediscovering Paradise: The Inimitable Rufus Rockhead” entitled the House That Rockhead Built. To jazz fans in Montreal, I don’t have to say anymore. It’s quite a read. Ro has already collected a considerable amount of data and is interested in Tom’s early life or any other part for that matter, and would love to know if any of you have photos or stories about him or knew him back when… If you do you can write about them in the comments at the bottom of the page or you can email him directly at rghandhi@sympatico.ca. It would be much appreciated. Let’s all do our part in keeping the Magic of Tom alive. It’s funny how things work out. We have a good and varied supply of magic tricks in the shop but there are tons of things I don’t have, not because I don’t think the effects are good, but, one, because we don’t have the space for everything and, two, most people nowadays, don’t give a hoot as to what we think is good, they want what they think is good, even though we may know better, having been in the business for over 35 years. I know I spoke of this before but people come in and demand to have what they saw on youtube or what Luc Langevin did or what they saw on America Has Talent. What do I know? So a few weeks ago someone placed a large order, a huge order, but he doesn’t want it all at once due to finances, but he definately wants everything he ordered. Could I order it all and he’ll take a few things at time, because he knows how difficult it is to get something once its sold out. The manufacturer may die, or not want to make it again, or if he does it may take a long time. Whatever, he wanted these things. This guy is not a new customer, so I do as he asked and he’s been taking the stuff as he said, but he still has some stuff here. These are not things I would ordinarily order, hoping someone would buy, as they are not cheap. One of the items is about $160.00. It’s called Santa’s Surprise. It’s a bunch of huge, beautiful cards and a surprise, dealing with Santa and Christmas. A long time customer comes in. He’s a pro and does not buy much as he is winding down. He may have wanted a thumb tip or rope, I forget, but it was no big deal. He caught sight of the box, which was not on a self and asked about it. I asked him if he wanted to see it, although I told him it was already sold. He said yes. He looked at the cards, saw the quality, the story line, and the possibilities, and asked if I could order him one. This is not someone who buys on impulse. He knew it was well made and he could make a great routine with it. If you have a lot of Christmas shows, it’s worth it, as it’s not over in a second, and it’s something the kids can relate to. There’s audience participation and lots of laughing and shouting. If you are not doing Christmas shows there is another effect, made by the same company, Razamatazz, called Rabbit Rampage. Good for all year round, same quality. Check it out!